If you’re coming to Lancaster for the first time to see American Music Theatre’s Christmas show, Home for the Holidays, or it’s an annual tradition for you and your family, we’d love to help you make the most of your visit to the area. Lancaster has so much to offer that will put even the Scroogiest of Scrooges in the Christmas spirit! If you head just 6 miles east on the Lincoln Highway (Rt. 30) you’ll get the chance to step back in time to the Christmases of your youth at the National Christmas Center. Think of it as a museum of Christmas lore and traditions, and it’s actually open all year round! But, make sure you stop by in 2017 – it’s closing down at the end of the season! From there, it’s just a quick trip to Strasburg to experience Christmas at the Strasburg Railroad. On weekends until Christmas, you can experience the Night Before Christmas Train or Santa’s Paradise Express (Check their calendar for details and exact dates and times). Plus, early in December, you can ride the Christmas Tree Train out to choose your own tree! Then, hop on back and visit our neighbors at Dutch Wonderland and their Dutch Winter Wonderland featuring a light show that will keep everyone in your family in the holiday spirit! But, that’s just the tip of the iceberg. We’ve mapped out some fun for you in the city of Lancaster, where you can stroll the streets, enjoy the decorations, and get some of your holiday shopping done. If you head downtown the week before Christmas (12/17 – 12/24), you’ll get free parking in metered spots, courtesy of the Lancaster Parking Authority. First stop is Penn Square, where the city’s Christmas tree is already lit, and creating a festive atmosphere right in the middle of the city. You never know when you might bump into some carolers. On Friday evenings, you can get horse-drawn carriage rides between 6:30 and 9:30 p.m. Rides depart from Fulton Bank at King & Queen Streets ($5 adults, $2 kids 12 and under). While you’re in the area, stop in and check out the holiday happenings at Lancaster Central Market on Tuesdays, Fridays, and Saturdays, and feast on all sorts of holiday goodies. Just across the street in the Lancaster Marriott at Penn Square you can visit Santa and get your picture taken every Friday from 6-9, and Saturday 10-3. Plus, they host a special one-time event for breakfast with Santa from 8-9:30 a.m. at the Lancaster Marriott. It usually happens early in December, so make sure you check the calendar early and reserve your tickets! If a traditional Santa isn’t your thing, stroll on up to Building Character on the 300 Block of North Queen Street and chill a bit with Hip Santa (for the hipster in all of us). Did we mention that Christmas can be educational? Get your dose of history at Yuletide at Wheatland, and experience Christmas in the home of Pennsylvania’s only president, James Buchanan. You might even see Civil War Santa. Or, perhaps science is more your thing. Check out the Polar Express like you’ve never seen it before at the North Museum of Natural History & Science. You’ll get a full-dome experience of the holiday classic in the planetarium. Plus, there will be plenty of fun activities throughout the museum. Finally, while you’re in town enjoying The First Noel, there are other local productions that are sure to delight you and yours. You can take the kids to see a Christmas production at Lancaster’s landmark Fulton Theatre. And to wrap it all up, ring in the new year with Lancaster’s very special New Year’s Eve Celebration from 10 p.m. to midnight in Binn’s Park featuring great music, the lowering of the red rose and fireworks, all for free! 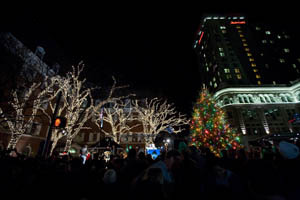 With all the holiday happenings in Lancaster, you’ll never want to go home!